The SIPs frame of the new pavilion - due to be delivered in March. A new year brings with it new beginnings and what a year 2019 has in store for Teddington Cricket Club. Almost five years after we began the process of looking to build a new pavilion, the day has finally arrived. 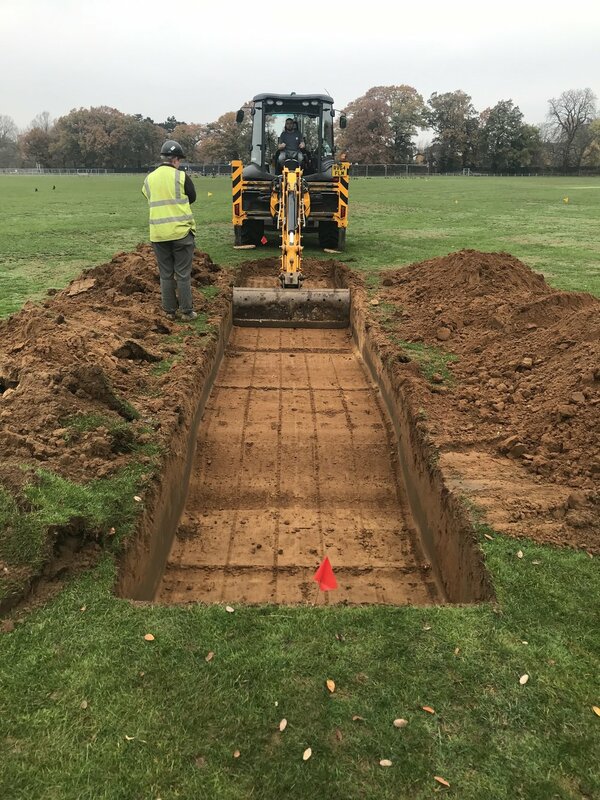 On Monday 7th January 2019, GPF Lewis will arrive in Bushy Park, mobilise the building site and begin building our new pavilion. In this update I will explain how we have got to where we are, why it has taken a little longer than expected and what you might see in coming months. So why the delay? As you all know planning permission was granted to erect a new purpose built pavilion and create a new entrance and car park back on 20th February 2017. The planning permission came with 27 separate conditions and informatives that, with the help of our architects Reed Watts, our builders GPF Lewis and the many external consultants we have had to employ, we have been working extremely hard to satisfy. As we found with the original planning application, speed is not of the essence when it comes to LBRuT’s planning department and some of these conditions have taken up to three months at a time to be signed off. You may have seen JCBs on site on a number of occasions over the last couple of months digging holes for all sorts of things; infiltration and percolation testing of the soil, archaeological investigations and unexploded ordnance surveys checking for the possibility of unexploded WWII bombs to name but a few! Consultants CgMs carrying out archaeological investigations. One of the major conditions we have had to meet is BREEAM which in Richmond requires all Non-Housing developments to achieve the rating “Excellent” in the interests of promoting sustainable forms of development within the Borough. BREEAM is the world’s leading sustainability assessment method for infrastructure and buildings and recognises and reflects the value in the highest performing buildings globally. This will mean that if the new pavilion achieves the “Excellent” rating it will be in the top 10% of sustainability performance for all new non-domestic buildings in the UK. The planning conditions and BREEAM have proven to be extremely time consuming, expensive and bureaucratic which have led to the delay in beginning the works. That and the late discovery of a Thames Water main running directly under the site of the new pavilion. This will mean completion won’t be until the end of August, as per the very detailed 33 week schedule GPF Lewis are working to. It will ensure though that our new pavilion will be innovative, built with the most sustainable materials available, be full of energy efficient systems and equipment, provide sustainable and reusable water usage and fundamentally reduce the building's impact on the surrounding community and environment. Which, when you are situated in a Royal Park and a Site of Special Scientific Interest, is no bad thing. The existing pavilion will continue to be in use throughout the new pavilion build and will then be demolished once we have moved into the new pavilion. The old site will then be returned to playing surface. The car park will be out of action from Monday 7th January as it forms part of the building compound. There will be no access or dropping off so all parking will have to be done in the Clapperstile car park accessed via Queens Road. Good practise for when our own entrance and car park is created. Over the last few months we have also been working with Teddington Athletic Football Club in submitting a joint application to the Football Foundation (FF) for grant funding to support our new mixed-use pavilion. If we are successful in our application to the FF, which is funded by the Premier League, The FA and the Government, and alongside the funding we have secured from the England & Wales Cricket Trust, The Gosling Foundation and LBRuT’s Community Fund, we will be able to build our new pavilion with little or no debt. The club would also like to thank those that helped raise £4,758.59 through Co-op’s Local Community Fund and everyone of our friends and members who have contributed to The Pavilion Appeal. Without your support none of this would have been possible. If you have yet to contribute and would like to do so please click on the link above for the donation forms. We hope the new pavilion will very much become a community asset for all of our members and friends and be used twelve months of the year. The hard work will continue once the building is built and up and running as we want everyone to come down and take advantage of what will be a truly first class facility. It will be a long time before any other amateur sports club will be in a position to build a new pavilion like ours and it is our responsibility as members of Teddington Cricket Club to make sure we make the best use of it. I think it is fair to say exciting times lie ahead in 2019. A cricket World Cup on home soil, men's and women's Ashes and no other major sporting competitions to compete. All of this cricket bundled up in one of the longest English seasons to date, running from the end of March until late September. Cricket will be front and centre for the whole of the summer and with a new pavilion at the end of it we at Teddington hope to be able to capitalise on the cricket fever that will have swept the country. So keep your eyes on the site if you visit Bushy Park as the days start to lengthen again. Given the way the pavilion is to be constructed, you should soon be able to see noticeable progress and hopefully it will inspire all our members to be successful this summer.